This is an adaptation of my Eevee pattern requested by my most returning customer to date. 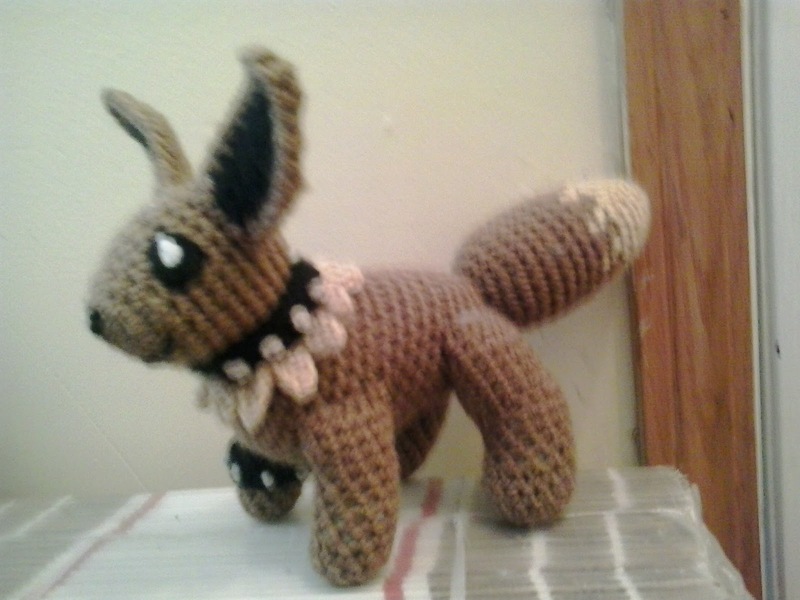 This is customer past the $4,000 mark of money spent on my work with Melody the Eevee. Simply, the changes to my original pattern are a different style to the neck fur and a band around Melody’s right front leg. Worsted Weight Yarn: Café Latte, buff, black, gray, and white. Finish off leaving a long tail. Using gray, embroider spikes on RIGHT FRONT LEG BAND using FRENCH KNOTS. Wrap RIGHT FRONT LEG BAND around right FRONT LEG and sew together. Finish off leaving a long tail. Using gray, embroider spikes on COLLAR using FRENCH KNOTS. Sew end of Rws of COLLAR together. Weave in ends. Rd 4: Holding next sc on NECK FUR and first ch from the free loops of foundation ch of COLLAR together and working through both thicknesses, slip st in next sc, (ch 4, sc in second ch from hook, hdc in next ch, dc in next ch, skip next sc, slip st in next sc) around. Rw 11: Holding INNER EAR and OUTER EAR together and working through both thicknesses, ch 1, working up side of EARS, sc in next 10 Rws, 3 sc in free loop of foundation ch, working down side of EARS, sc in next 10 Rws. Finish off leaving a long tail. Embroider cafe latte triangle in bottom of INNER EAR. Sew EARS to HEAD. Embroider EYES and NOSE on EEVEE. Finish off leaving a long tail. Weave tail through sc of Rd 18, pull tightly and secure. Sew TAIL to BODY. Eevee and Pokemon are copyright Nintendo and their respective creators. This pattern is an original pattern and is © by Christjan Bee (June 2018). Please do not claim this pattern as your own. If you wish to share this pattern, you may link to this pattern but please do not reprint it on your site. You may keep a copy for your own personal use but you may not sell or distribute it, or sell items made from this pattern.